From the jungles of 9,597 Wanderers at Wanderland Music and Arts Festival 2017, dare to explore the world of Wanderland Pixels as it celebrates it’s 6th run in bringing together good music and good people! Level up the adventure and conquer the south on March 10, 2018 at Filinvest City Event Grounds, Alabang. The biggest international and homegrown indie acts are set to accomplish one important mission: to power up the best Wanderland stage yet. Have you tried Canadian Beef? Do you know why they say it’s better than USDA Beef? The first time I tried Canadian Beef was at the official residence of the Canadian Ambassador in Manila, which was prepared by a Canadian chef. Sustainable Seafood Week 2018: Restaurants and Hotels Join Together In Saving The Seas! The future of our oceans is at stake, and it will take everyone working together to reverse the tide. The Sustainable Seafood Week is a celebration of food and a venue for sharing the best practices in sustainable fisheries by various stakeholders. Where establishments come together on an open and dynamic platform, to discuss the status and challenges for more sustainable seafood, bringing inspiring solutions for change in the fisheries and aquaculture sector and to raise awareness in public. February 26 to March 18, 2018, will be a long week affair of the third Sustainable Seafood Week organized by top hotels and restaurants in Manila along with the different environmental groups and fisheries NGOs. Madrid Fusion is the most influential culinary congress in the food world, not to mention a haven for the gastronomic Spanish cuisine. Now on its 16th year with the theme “Fourth Generation: Those Who Own the Future“, the Congress is meant to showcase how you can future-proof your restaurant business and satisfy the ever-evolving demands of the food industry. I’ve attended Madrid Fusion for the last 4 years, and this year is a turning point–a passing of the baton to the next culinary generation. A big part of the lives of people from the Northern Philippines is Agriculture – the bread and butter of most families, if you will. So much of their lives revolve around grains and produce that it’s only fitting for them to dedicate an annual festival for it. “Bambanti” is the Ilocano term for scarecrow. The watchguards of their fields and farms. This year, 20 out of 34 municipalities joined in the festivities. Fot for the past 5 years, GK has organized a Social Business Summit where social entrepreneurs from around the globe come to share their stories of their struggles and success. The summit is possibly the largest annual gathering of social entrepreneurs in SE Asia. Gawad Kalinga / GK Enchanted Farms is a Social enterprise which aims to end poverty for 5 million families in the Philippines. The organization is made up of a group of dedicated volunteers and education professionals who have a practical and efficient solution to tackling the endemic poverty that is a reality for millions of Filipinos. Their mission has been to empower the youth born into poverty by educating them in skills that will benefit them and their community. VALENTINE’S 2018 Manila: Fancy Date Dinners & Ideas! As the whole world celebrates love this Valentine’s Day. Bring the season of love to greater heights with our list of Valentines’ hotel packages happening around the metro. Woo your date with a romantic rooftop dinner, staycation, spa day or even a grand view of the pryro musical & fountain shows. NEW YEAR’S EVE MANILA: Countdown to 2018! Start the year right and indulge in a complete experience of comfort and sophistication. Spend a night in one of our deluxe rooms with a complimentary breakfast buffet for two and enjoy a relaxing head, neck, and shoulder massage for only PHP 14,730 nett. You can also witness the world’s biggest multi-color dancing fountain here, before heading off to party at the Cove Manila. Exclusive dining offers from our signature restaurants. Venue: Medley Buffet, Red Spice, Goryeo, Japanese Kappou Imamura, La Piazza, Enbu. Live Entertainment at the Crystal Corridor. Enjoy live music in the evening from DJs and bands and a special projection mapping show along the Crystal Corridor. Witness The Fountain in its full splendor. Time: 6 PM to 12:30 AM. Welcome 2018 in style with the best view of the fireworks. Grammy Winner for Best Remix in 2013 for his version of Lana Del Rey’s ‘Summertime Sadness’. A monthly Spotify audience of over 5 million listeners. Billboard, UK & ARIA Chart Top Ten Hits. Multi-platinum selling singles. Beatport, Buzz, Hype Machine & Cool Cuts Charts Number 1′s. 2 BBC Radio One Essential Mixes. 3 Essential New Tunes. A weekly Global Radio show. These are just a few things that have been making French born Miami resident Cedric Gervais one of the most sought after House DJs & electronic music producers in the world today. With his imprint ‘Delecta Records’ where he releases regular singles, alongside a major label deal with Universal Worldwide (Island). Dance to his beats as you celebrate the start of 2018 in the newest and biggest premier club in the Metro. Whiskey or whisky, depending on where you're from, is a type of distilled alcoholic beverage made from various fermented grains. The word literally means "Water of Life" and is considered to be one of the best spirits in the world. Distilleries typically age it in casks or wooden barrels, which give the drink its distinct flavors. Filipinos have slowly begun to appreciate the darker spirits such as Whiskey, which has caused the beverage to gain a better reputation in the Philippine market. The drink is no longer a foreign concept but has instead become a staple in Filipinos' celebrations such as intimate events, gatherings, and festivals. 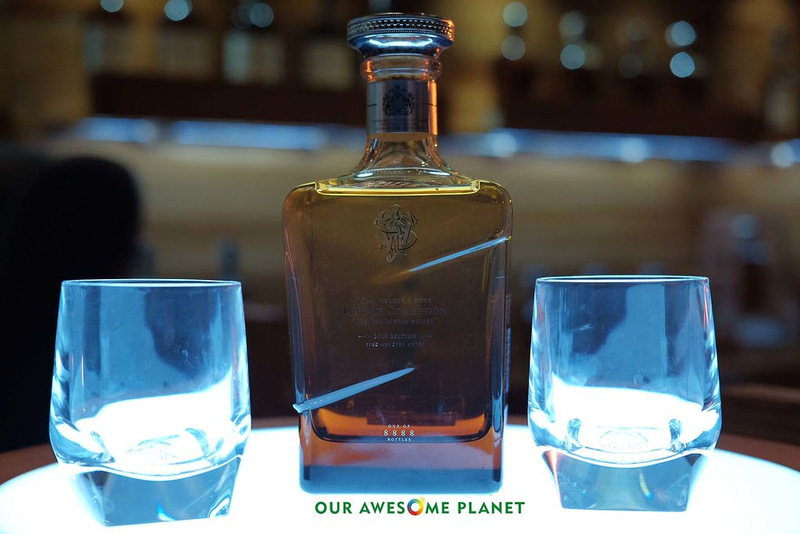 World-class whiskey recently made its way to Manila via Whiskey Live 2017, one of the biggest whiskey tasting celebrations in the world. It was held on October 20 and 21 at Shangri-La, The Fort, and showcased a wide array of what whiskey has to offer. For a newbie, this can be intimidating, but what better way to learn about the awesome drink than to taste it?